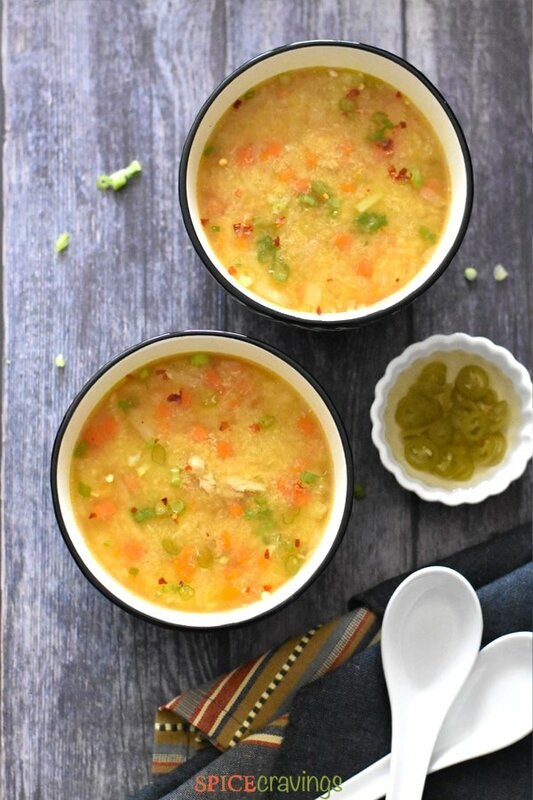 Simple and delicious, this clear yet creamy Chicken Sweet Corn soup is pure comfort food. 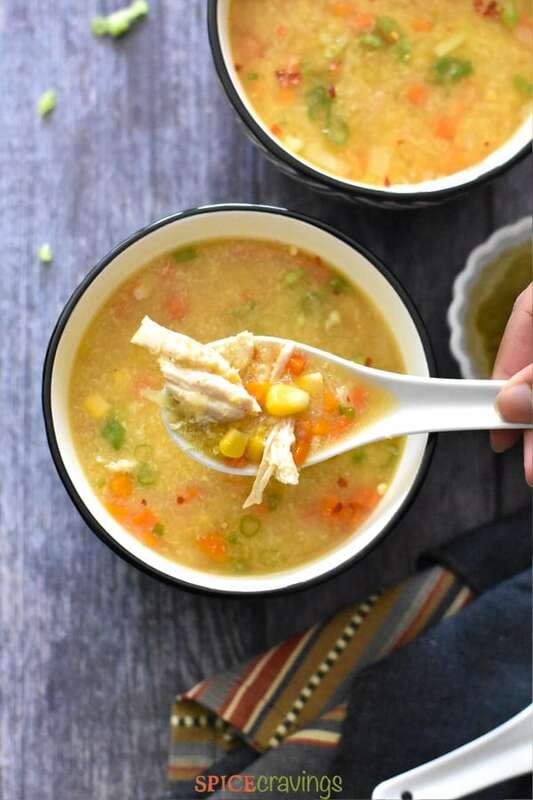 Its made with healthy ingredients like sweet corn, crunchy vegetables, in a flavorful chicken stock, and finished with an egg drop confetti. This soup will warm you up instantly! This recipe is part of my dump and go meal series. You add in the ingredients and pressure cook. Open after releasing pressure, add cabbage and egg, simmer, and you’re done! Check out more Dump and Go meals here! Chicken Sweet Corn soup always brings back some fun childhood memories for me. Growing up, my family, all big lovers of Chinese food, used to eat at a restaurant called “Daitchi”. We would order the same dishes every single time. My dad and I would start with a Wonton or Hot & Sour soup, and my mom and sister would ALWAYS get the Chicken Sweet Corn soup. And the best part is, that dad and I would end up digging in to their bowls. It was just that good! ✓ Make creamed Corn: Blend together 1 cup thawed or fresh yellow sweet corn with 1/4 cup stock or water. Blend into a coarse paste. Wait 5 minutes before carefully releasing the pressure manually (NPR 5, then QR). This prevents the soup from squirting out of the pressure valve. ✓ Simmer: Turn on Saute and check for seasoning. Add cabbage and sesame oil. Beat an egg and add to the pot WHILE stirring continuously. This makes the egg cook in thin ribbons instead of chunks. This also helps thicken the soup. ✓ Optional step for thickening more: If you want to thicken the soup more, add the cornstarch slurry while stirring the soup. ✓ Optional Garnish, Chili-Vinegar: In a small microwave safe bowl, add thinly sliced jalapeno and rice vinegar. Microwave for 30 seconds and cool. How to Make Homemade Creamed Corn? The classic flavor in this recipe comes from creamed corn. You can use a can of creamed corn, but it is even simpler to make it at home. Just blend a cup of yellow sweet corn with stock, water or milk. I love one-pot recipes that include a good balance of all, or most food groups. 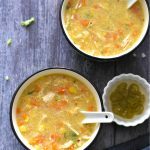 Between the sweet corn, veggies, chicken and egg, this Chicken Sweet Corn Soup is a pretty well-balanced meal. 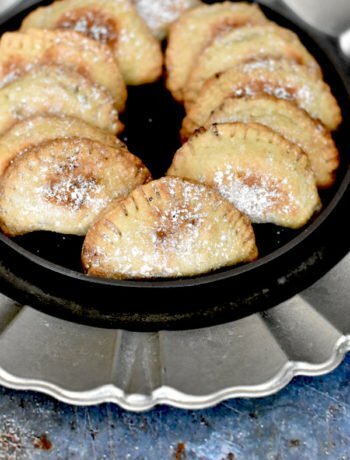 It’s a gluten-free dish, since the only flour it uses is cornstarch, which is gluten-free too. You could also called it a lighter version of Chicken Corn chowder, minus the heavy cream and the flour. How to Make Vegetarian Sweet Corn Soup? 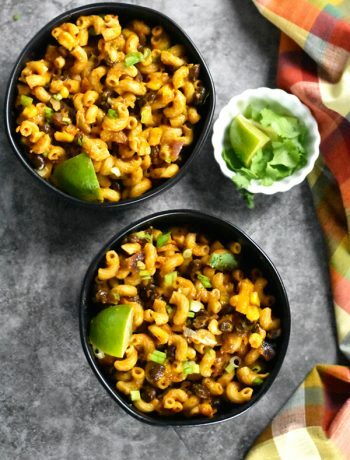 You can easily customize this recipe and make it vegetarian. ✓ Skip the chicken and add everything as in the instructions. ✓ Reduce the cooking time to 5 minutes and follow the recipe. ✓ As for egg, feel free to skip it if you don’t eat eggs. ✓ To thicken the soup, add 1 tablespoon of cornstarch dissolved in 3 tablespoons water. Add while stirring the soup. Bring it to a simmer and turn off the heat as it thickens. 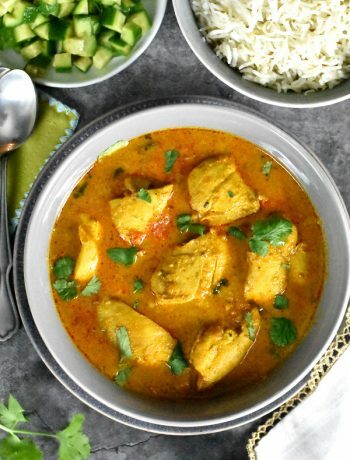 Skip the chicken in this recipe and cook as per instructions. Check with the vegetarians if they eat egg. If they don’t, skip the egg drop part of it. Shred the chicken separately and add about 1/4 cup in each bowl for the meat eaters. Broil it in the Oven: You can season the chicken breast with salt and pepper and broil it in the oven for 7-8 minutes each side. Stove-Top: Turn on stove to medium-high heat. In a sauce pan add about 2 cups chicken stock and one chicken breast. Cook for 15-18 minutes, or till fork tender. Buy it pre-shredded: These days many grocery stores carry cooked pre-shredded chicken in the deli section. You can use that too. 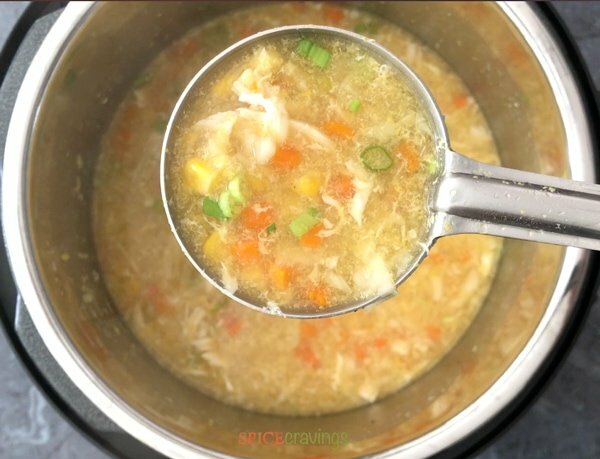 How to Make Chicken Sweet Corn Soup on the Stove? ✓ Heat a stock pot on medium-high heat. ✓ Make creamed corn as per the instructions. ✓ Add all the ingredients listed under “Pressure Cook” and stir. ✓ Remove chicken and shred it using two forks. Beat an egg and add it to the pot while stirring, so it cooks like thin ribbons. ✓ If you want to thicken the soup more, make a cornstarch slurry and add it to the pot while stirring. Bring the pot to a boil and turn off the heat. ✓ Garnish with spring onions and chili-vinegar and ENJOY! Simple and comforting, this clear yet creamy Chicken Sweet Corn soup is pure comfort food. 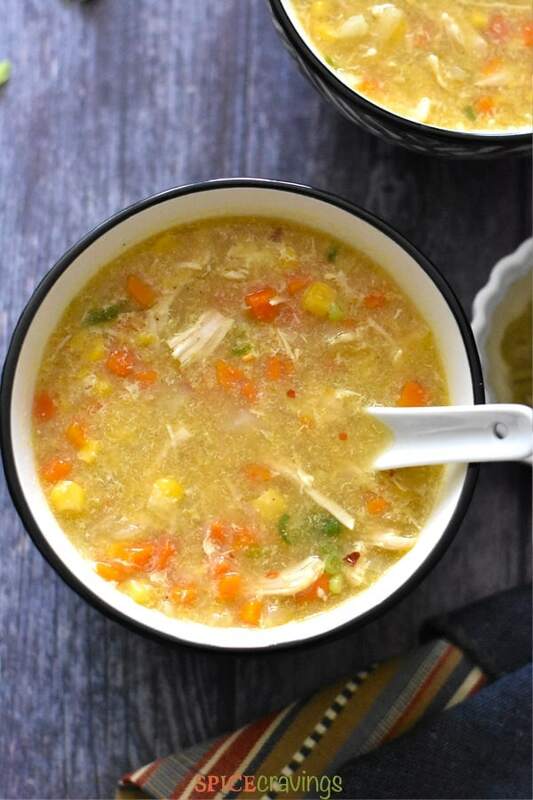 Its made with healthy ingredients like sweet corn, crunchy vegetables, in a flavorful chicken stock, and finished with an egg drop confetti. Blend together 1 cup thawed or fresh yellow sweet corn with 1/4 cup stock or water. Blend into a semi-smooth paste. 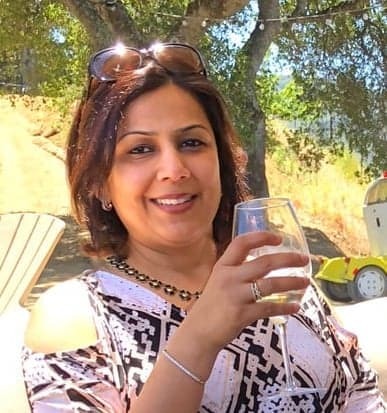 Turn on the Instant Pot. Add all ingredients listed under "pressure cook" in the ingredients list. Close lid and pressure cook on Manual/Presscure cook (high), for 8 minutes. Turn on Saute and check for seasoning. Add cabbage and sesame oil. Beat an egg and add to the pot WHILE stirring continuously. This makes the egg cook in thin ribbons instead of chunks. This also helps thicken the soup. In a small microwave safe bowl, add thinly sliced jalapeno and rice vinegar. Microwave for 30 seconds and cool. Note: The nutrition facts below are my estimates. They do not include the garnishes. If you are following any diet plan, I recommend cross-checking with your preferred nutrition calculator.